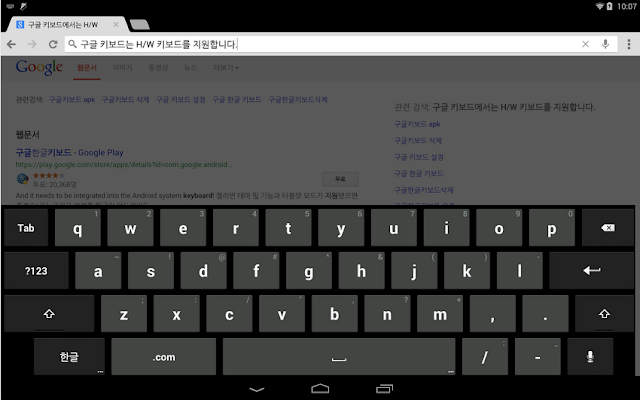 Thanks to a recently uploaded screenshot to the official Korean Google Keyboard listing on Google Play, we may have our first look at Android 4.4, which has officially been dubbed Kit Kat. The screenshot, as you can see above, shows a grey notification color scheme along with a Key Lime Pie debug icon. As you all know, Key Lime Pie has been Google’s internal codename for Kit Kat as they get Android 4.4 ready for release. Depending on how recently this screenshot was taken, they still may be running with KLP up until the last possible minute. The status bar has light gray icons and clock font, which has been suggested in a number of leaks. There was also a hint of gray icons in the recently leaked video. Over on the other side of the status bar is a debug icon – a piece of pie. The debug icon in Jelly Bean is a little Android jelly bean, so this screenshot was probably taken on a device that still had the decoy Key Lime Pie ID. We knew Google was keeping things under wraps with regard to the KitKat naming, and it looks like designers are still working on getting the Android 4.4 graphics updated. These gray status bar icons could be just the tip of the iceberg. The rumors have been pointing to a more significant update to the UI of Android with 4.4, but we don't have anything concrete to confirm just yet.